I’d been lamenting the lack of good Chinese food in Fairfield County, a complaint I’ve shared with quite a few food lovers here, including a friend who’s a Westport transplant from Singapore. To stop my whining, said friend took me to her family’s favorite Chinese restaurant in Fairfield, Hunan Pavilion. Ever since, I haven’t been deprived of good Chinese nearby, and now neither will you. Hunan Pavilion has been in the same Post Road location in Fairfield for 22 years and it’s very good. But to insure a truly exceptional experience, skip over the conventional menu and jump right to the Shanghai Bund Select (or Shanghai New Menu), an edited list of house specialties and an eclectic mix of Shanghai, Szechuan, and Hunan cuisines. Also ask for the menu in Chinese, even if you don’t speak a word of any dialect. The Chinese menu isn’t overly extensive, and if you aren’t shy about it, the staff will patiently translate, and this is where the hidden treasures can be found. The food at Hunan Pavilion is the opposite of what bad Chinese food can be: it’s not overly saucy, gloppy, greasy, or even salty. Fried dishes are done especially well. 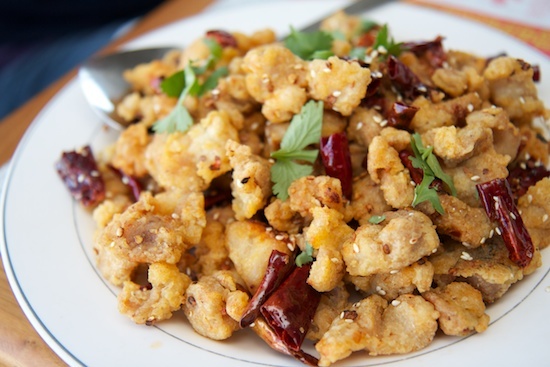 Crispy Chile Chicken (above), crunchy bite sized of breaded chicken tossed with fermented black beans, slivers of fresh ginger and garlic, sesame seeds and fragrant dried hot red chiles, which added both heat and flavor. Spicy Rock Shrimp, actually just large shrimp not the rock variety, were seasoned with salt and black pepper, lightly battered, and sprinkled with fried shallots, crisp and juicy and divine in its simplicity. Shanghai Dumplings had a delicate filling of pork, ginger, and scallion and were encased in a silky exterior skin. These were so delicious that our order virtually disappeared almost as quickly as it hit the table. Ants Climbing on a Tree, a classic Szechuan dish of bean thread noodles and ground pork, glassy, slippery noodles were bathed in a perfectly balanced spicy sauce dotted with fresh scallion. Snow Cabbage with Pork (above)--more vegetable than meat--was bright and fresh tasting. Shredded cabbage tossed with edamame and slivers of crunchy bamboo shoots in a light white sauce, was a gentler dish, and a welcome compliment to the spicier menu offerings. Shredded Beef Szechuan, tender strips of beef stir fried with crisp shards of celery, julienned carrot, and scallion pieces all mingled with the subtle buzz of Szechuan peppercorns. Wonton Soup, perhaps a more conventional choice, nevertheless had a full bodied broth with wilted baby spinach. Wonton fillings are offered with a choice of shrimp or pork, and either one offer good examples of this Chinese menu staple. Misses include the Buddhist Delight, a combination of vegetables that would’ve been equally at home in the supermarket frozen food section. Its brown sauce had a strange sweetness that was otherwise flat and nondescript. Lamb with Cumin, a drier stir fry with onion and white mushrooms, had promise. And though the lamb was nicely cooked, there was a heavy hand with the cumin which tasted raw and coated the dish with an unpleasant grittiness. I’ve rarely met a noodle I didn’t like, but my heart sank when the Zhajiang Noodles (also called Peking Dan Dan Noodles) arrived. Drenched in an unappetizingly thick sauce with peas and tofu, it was virtually flavorless. Navigating through the menus at Hunan Pavilion is key to a happy experience here. If you steer away from the conventional and try your hand at some of the more creative and authentic offerings, it can be a welcome and sometimes revelatory experience, especially if you’ve been craving some truly good Chinese food closer to home. Free Delivery to Fairfield, Southport, and select areas of Easton and Westport nearer to Southport.